Semtech Corporation(Nasdaq: SMTC), a leading supplier of analog and mixed-signal semiconductors, today announced the availability of a new LoRaWAN™-connected development kit from wireless hardware and software manufacturer Libelium and network services and software provider Loriot that should allow designers to speed up the development and testing of their Internet of Things (IoT) applications. Comprised of a gateway and ten sensor devices, featuring Semtech LoRa® technology, application software, and a connection to Loriot’s cloud-based LoRaWAN network, the new development kit is optimized for smart city, smart security, smart environment and smart agriculture applications. The kit is available for both North America (915 Mhz) and European (868 MHz) frequencies. 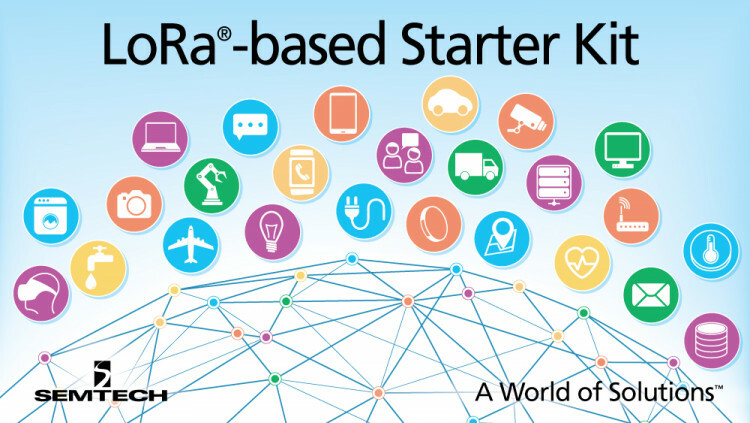 Semtech, Libelium, and Loriot are members of the LoRa Alliance, a group of over 300 companies committed to driving and enhancing the LoRaWAN specification to ensure interoperability and scalability of LPWANs and IoT applications. Through its work with member companies and IoT industry groups, it is making LoRaWAN the standard for LPWANs focused on low power, long-range IoT applications. To date, there are LoRaWAN public and private networks in more than 50 countries worldwide. Libelium designs and manufactures hardware and a complete software development kit (SDK) for wireless sensor networks so that system integrators, engineering, and consultancy companies can deliver reliable Internet of Things (IoT), M2M, and Smart Cities solutions with minimum time to market. For more information, visit www.libelium.com. All statements contained herein that are not statements of historical fact, including statements that use the words “to deliver,” “will,” or other similar words or expressions, that describe Semtech Corporation’s or its management’s future plans, objectives or goals are “forward-looking statements” and are made pursuant to the Safe-Harbor provisions of the Private Securities Litigation Reform Act of 1995, as amended. Such forward-looking statements involve known and unknown risks, uncertainties and other factors that could cause the actual results of Semtech Corporation to be materially different from the historical results and/or from any future results or outcomes expressed or implied by such forward-looking statements. Such factors are further addressed in Semtech Corporation’s annual and quarterly reports, and in other documents or reports, filed with the Securities and Exchange Commission (www.sec.gov) including, without limitation, information under the captions “Management's Discussion and Analysis of Financial Condition and Results of Operations” and “Risk Factors”. Semtech Corporation assumes no obligation to update any forward-looking statements in order to reflect events or circumstances that may arise after the date of this release, except as required by law.